Kette – My name is Iya Haman Marcel. 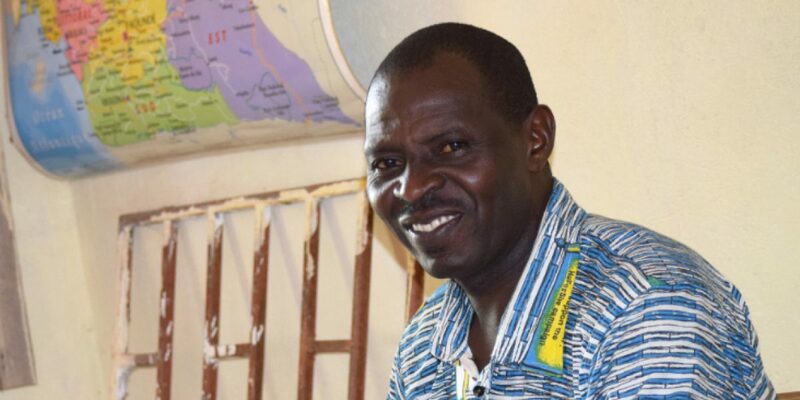 I am the Director of the primary school in Kette, a village situated less than 45 km east of the Cameroonian border with the Central African Republic. When I was appointed in 2012 there were just 47 pupils in the school. In 2015 there were some 900 pupils, including 100 refugees, and for the school year 2015-2016 we had 1,300 following a massive influx of more than 200 extra refugee children. I hardly knew which way to turn, or whom I could ask, in order to obtain reinforcements to help teach and look after the children. In fact there were just three of us to handle the teaching – two parents and myself. Then one fine morning, as if answering my prayers, a team from the Jesuit Refugee Service arrived, headed by Michel Bizoza, Project Director in Batouri, and Sister Joséphina, Educational Activities Coordinator. This was apparently a highly significant meeting as it was part of their mission to provide educational support for refugees. I breathed a huge sigh of relief and felt really quite proud to be able to provide all the information they were seeking. A few months later, as part of their action plan, the team had provided the school with a good selection and quantity of school books, tables and benches – all of which added a modicum of extra comfort, especially for the pupils. In addition, they renovated the classrooms and helped us recruit seven extra teachers. You can imagine how pleased I was to be able to return some of these favours by accepting to lead a campaign against illiteracy in the refugee camps. The children in such emergency situations have simply no notion of learning or teaching, of how to work together, or of elementary personal hygiene and the importance of wearing clean clothes. It was, and is, desperately sad to see. They came to school dirty, unhappy and impoverished. Worse still was to see them at break times, a group apart, not knowing how or whether to join in the games and with nothing to eat, in sharp contrast to the local children. To help alleviate this spiral of alienation, I kept a small budget of some thousand CFA francs to buy doughnuts, etc. for break times – but it was a drop in the ocean and never enough. I am therefore seeking the support – moral, physical and financial – of highly motivated people to help with a project designed to help these children prepare for a better future – by fighting malnutrition with the creation of a school canteen and by inculcating the basic principles of personal hygiene and general cleanliness concerning their clothing.